Home PowerShell SharePoint SharePoint 2013 SharePoint 2016 SharePoint Designer 2013 SharePoint Online How to Disable SharePoint Designer 2013 using PowerShell? How to Disable SharePoint Designer 2013 using PowerShell? ISharePoint Designer 2013 is a great free tool from Microsoft to customize SharePoint sites and create workflows. Why should we disable SharePoint designer? Well, In some cases site owners and designers may damage SharePoint with this Powerful utility, and I've seen SharePoint designer become SharePoint destroyer! So, to prevent from irreversible damages to SharePoint, we decided to disable SharePoint designer. Since there are no upgrade to SharePoint Designer, SharePoint Designer 2013 continue to support creation and modification of SharePoint sites, pages and workflows for SharePoint 2016 and SharePoint Online environments. How to disable SharePoint designer in SharePoint 2013 or SharePoint 2016? You can disable Microsoft SharePoint Designer at Web application and Site collection levels. From the ribbon, Click on General settings drop down and select SharePoint Designer. Unselect all check boxes (or whatever applicable to you) and hit OK to save! To allow SharePoint designer to be used in this web application, revert the above steps by ticking all check boxes. Lets disable SharePoint Designer 2013 using PowerShell. $webApp = Get-SPWebApplication -Identity "http://intranet.crescent.com/"
SharePoint has the ability to disable SharePoint designer at individual site collection level. 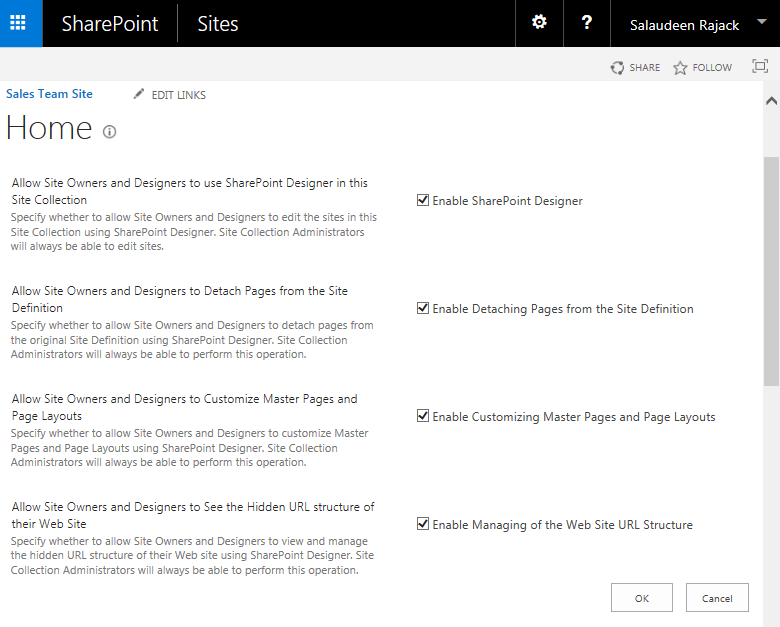 Here is how to disable SharePoint designer for a site collection. Login to your SharePoint 2016/2013 site collection(or SharePoint online) as an administrator. Click on Site Settings gear >> Select Site Settings. 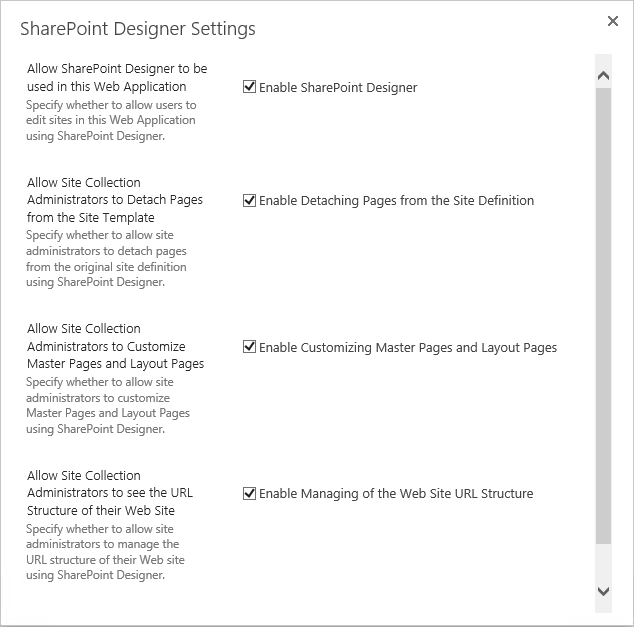 under Site Collection Administration, select SharePoint Designer Settings. Unselect all the options listed. So from now, SharePoint Designer will be disabled for all users including Site collection Administrators! As this is at site collection level, you'll have to repeat these steps for each site collection! Here is the PowerShell to disable SharePoint designer at site collection level. This Stops SharePoint designer from changing code! To enable SharePoint designer using PowerShell, set the $False flags to $True. Your single Site Collection code seems to be twisted: Disabling by setting to $true ?